I managed to get out for some photos during our last snow storm. 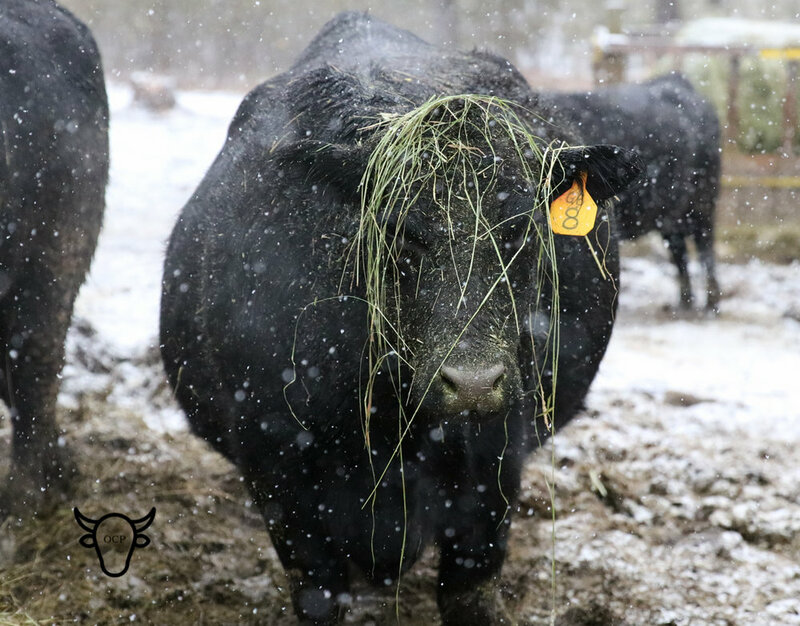 I found Foreman had smartly made something to protect her from the snow or maybe she was just having a bad hair day. Really, it is because she is a naughty cow who searches for leaves in the bottom of the feeders and throws everything else out. She walked around like this for quite awhile before I took it off for her. She is now on the vet's feed bill and being readied for an embryo flush. This normally lovely lady has provided us with two wonderful calves. One was a standout at the 2017 MBT sale and the other is a much coveted heifer who is even sweeter than her mother - as impossible as that sounds! Speaking of Midland Bull Test, they just posted their results of the last weights for GS 1 today. It was completely unfair of them to post yesterday to stay tuned for weights and then make us wait for over 24 hours! Argh!!! E-3 Bobber did not make it the cut off. He ended up in the sick pen. Drat. The other three did alright, with MBT 82 Murphy making a strong comeback from his early tummy troubles. He gained 98 pounds in the past month. MBT 81 Cisco is the heavy hitter, as expected. MBT 79 Bennett is not to be discounted and had a great finish. Some stats have been added to their respective pages - check them out!